Brine cured is a reference to numerous types of cheese that are washed with, or submerged into, a brine bath as part of the cheese making process. The cheese must remain in the brine for several hours to several months depending on the type of cheese being produced. The salty brining solution helps to limit the growth of unwanted bacteria that can produce a foul taste in the cheese (although in other stages of the cheese making process, some types of good bacteria are necessary for producing the cheese). The brining solution provides cheese with a slightly salty, savory flavor that is quite desirable in many types of cheese. 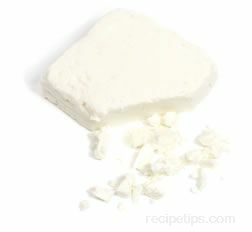 Feta cheese, the popular sheep's milk cheese of Greece, is cured for several months in a brining solution that contains whey. Once the cheese has cured for the appropriate time, it is removed from the brining solution and dries out quickly. It is then salted and allowed to age for several more weeks before it is ready to use. Feta is a traditional Greek cheese made from sheep's milk, but it can also be made from goat's milk or cow's milk. 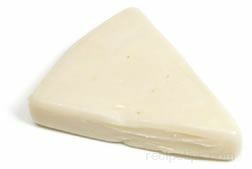 The color of the cheese is white, and it usually has a crumbly texture. It is cured for several months in a brining solution that contains whey. Once the cheese has cured for the appropriate time, it is removed from the brining solution and dries quickly. It is then salted and allowed to age for several more weeks before it is ready to use. Its sharp, salty taste makes it an excellent choice to serve in salads or dipped in olive oil as an appetizer. Graviera is a variety of cheese that originated in Greece and is much like Gruyere cheese. It is usually made from cow's milk, but occasionally sheep's milk is added. Graviera has a semi-hard texture and a mildly nutty and slightly sweet flavor. Halloumi is a cheese that was traditionally made with sheep's milk or goat's milk, but today it is most often made with cow's milk. The cheese originated in Cyprus, but it is also made in Lebanon and Romania. 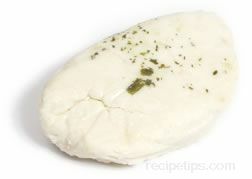 Somewhat similar to Mozzarella, it has a rubbery texture with a bland flavor and is primarily used as a cooking cheese, since it holds its shape well when heated. 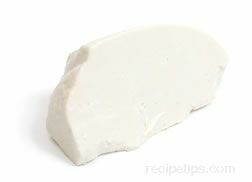 When making Halloumi, the curds are heated in water or whey; then the curds are kneaded and rolled out into a slab that is cut into blocks, which are stored in brine until ready for packaging or use. After the cheese is heated, fresh mint is chopped and mixed into the cheese, giving it an herbal flavor, as well as a salty flavor resulting from the brine bath. Generally, the flavor is most often considered to be mellow and somewhat tangy. To reduce the saltiness, the cheese can be washed after it is removed from the package or a little lemon juice and olive oil can be added to the cheese before it is served. Often referred to as a "stretched curd" cheese, Halloumi can be fried or grilled, which makes the outside crispy and the inside soft and creamy. It slices well and is a good cheese for snacking, as an ingredient in sandwiches, or to serve as a tasty appetizer. It also goes well with vegetables, such as tomatoes, sweet peppers, cucumbers, or zucchini. Another spelling for this cheese that is occasionally seen is Haloumi. Kasseri is a Greek cheese made from either sheep's milk or goat's milk. 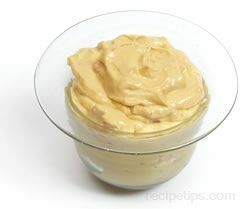 It is dull white to pale yellow in color and has a semi-hard consistency with a springy texture. The cheese is similar to provolone in flavor, but it is milder with a slight buttery taste. Kasseri is a versatile cheese that can be used for many purposes, such as for grating, as an ingredient in casseroles, and for grilling. If Kasseri cheese is unavailable, Italian provolone can be used as a substitute. Kefalotiri is a Greek cheese with filled with irregular holes and has a color that is pale yellow. Made from sheep's milk and goat's milk, Kefalotiri has a hard texture, which makes it useful as a grating cheese. It is often served atop cooked dishes as a tasty garnish. The flavor of the cheese is rather strong flavor and the aroma is sharp. It is saltier and somewhat harder than Kasseri cheese. The name, Kefalotiri, is derived from the Greek word kefali, meaning head, because the cheese is most often shaped into the form of a head. Native to Greece, Kopanisti is a soft blue cheese made from whole sheep's milk. Salt and ground pepper are added to the cheese before it is aged, which gives it quite a strong flavor. Kopanisti is a good choice to include in a meze, which in Greece is a selection of appetizers served prior to the main course. 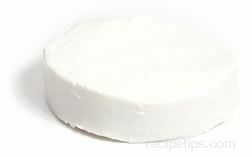 Manouri is a popular variety of Greek cheese made from sheep's milk or goat's milk. The cheese is a white with a very creamy, smooth texture. It has a milky flavor with a hint of mild citrus. Manouri doesn't have a rind. Manouri cheese is available in various shapes and sizes. It can be served as a snack, or it can be served with sliced vegetables, such as tomatoes. Another favorite way in which to use the cheese is to insert it into baked items, such as sweet pastries, to enhance the flavor. Manouri is also known as Manoypi. Traditionally made with the whey from Feta or Kefalotiri cheese to which a bit of milk or cream was added, Mizithra is a Greek cheese that is sold both as a fresh cheese and as an aged cheese. Fresh Mizithra is soft, resembling cottage cheese. The aged version is shaped like a large egg and has a firm texture. It has a pungent aroma, but the flavor is mild. 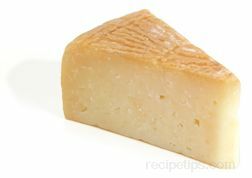 The aged cheese, also known as Xinomyzithra, is an excellent grating cheese. Mizithra is also spelled Myzithra. Xinomyzithra is the aged version of the Greek cheese, Myzithra. It has a strong flavor and a firm texture, which makes it a good choice to use as a grating cheese. Xynotyro is a Greek cheese made from sheep's milk and goat's milk. It is an unpasteurized whey cheese with a distinctive sweet and sour flavor. Xynotyro cheese is drained and cured in reed baskets resulting in the finished cheese having distinctive markings on the surface created from its contact with the reed baskets. The cheese is sold in various shapes and sizes. Xynotyro is best when used as an addition to salads or as a tasty ingredient in various baked dishes.